Druva cloud storage is an innovative company with three major objectives: secure file sharing, team collaboration and data loss prevention. To facilitate achievement of those objectives, Druva provides two major service categories, each containing multiple plans for a wide variety of solutions. The On-Premise plan can be configured to your individual server, and both plans accomodate the size of company or team and offer individual pricing. Druva inherits Indian roots in its vision and management while implementing valley-centric corporate culture, and the company strives for a global market presence. It provides world-class technical and commercial support to more than 1300 multinational customers across 46 countries. Among its multinational customers are NASA, Bechtel, Emerson, DHL, General Electric, and other industrial giants to name a few. Druva has achieved a multitude of prizes and accolades for its world class cloud storage services, which are clear indications of its industrial grade services on the market place. Five years ago, a visionary management and technical team based in Silicon Valley got together to provide an innovative and exciting data storage and file sharing service to help businesses improve efficiency, coordination, security, and reliability of their data. For this purpose, they devised a comprehensive data backup and file sharing system perfect for the achievement of all key objectives. The management team strongly believed in the principle of certainty and continuity of data flow and its utilization. Druva is the symbol of certainty in Hindu mythology, and the Druva service-based company emerged from this visionary thinking with a customer-oriented commitment by the company’s expert team. 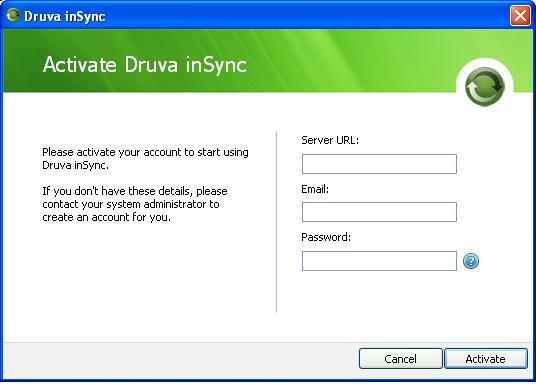 Druva offers plans for small business to large corporations, as well as separate plans for those wishing to run their own servers (inSync On Premise) instead of using Druva’s (inSync Cloud). 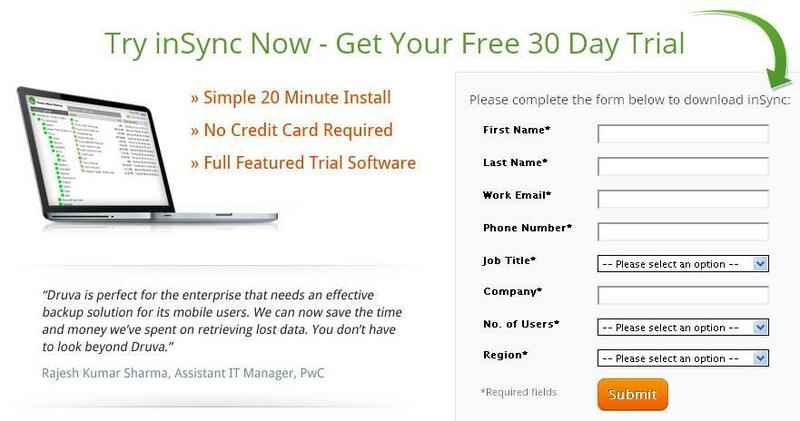 Registration and service management are simple, and the inSync client software is light weight and highly featured. 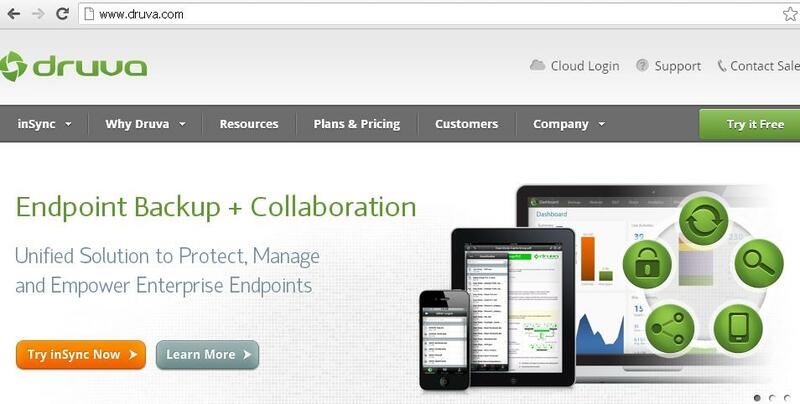 Druva offers comprehensive and consolidated plans for businesses of all sizes at competitive rates. Its two major service categories, serving those either with on-site servers or those wishing to use Druva’s cloud servers, each have three unique service plans. Categories and their subsequent plans are given below. 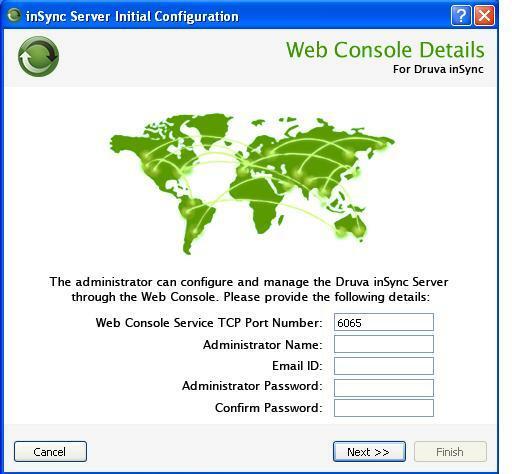 Customers can use their own on-premise servers to run Druva. Pricing schemes are given below. 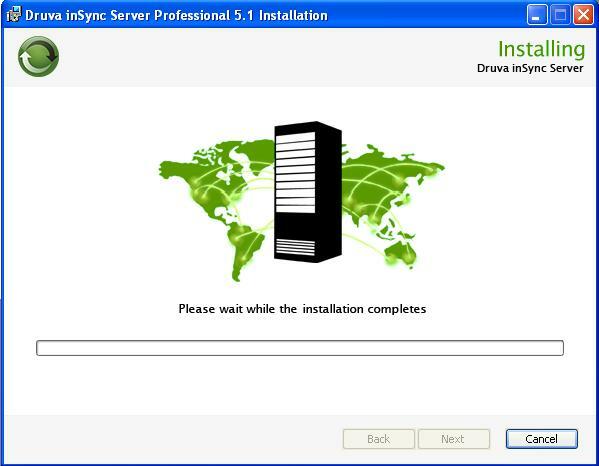 Clients may configure and use virtual private servers. 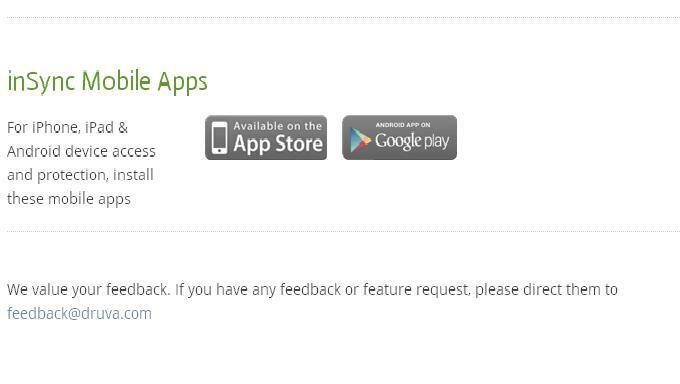 Pricing schemes are given below. High-level physical security from industry leader Amazon AWS, SAS-70 Type-II, strict access control, secure encryption keys, and compartmentalization of customers’ data. Optimized network use and intelligent resources utilization. Octopus engine queries about the status of network parameters such as latency, congestion, and noise. Responds accordingly to produce optimized performance. Word class customer support available around the clock via chat, email, phone and trouble tickets. Druva was developed for business-data security with the understanding that data is a company’s mind. Security plays a vital role in keeping business data safe, both storerd and in transition. Druva provides enterprise-class security, including encrypted transmission of data over secure SSL protocol, 256-AES-based encryption, a two-factor encryption/decryption mechanism, and many other protocols. Here is a summary of Druva’s security services. Mission-critical-level security from end to end; data is encrypted with 256-AES coding protocol and then transported through highly secure connections. Cloud servers located in Amazon data centers, which are certified under many industrial security standards, such as SAS-70 Type-II, Biometric access, surveillance and monitoring systems. 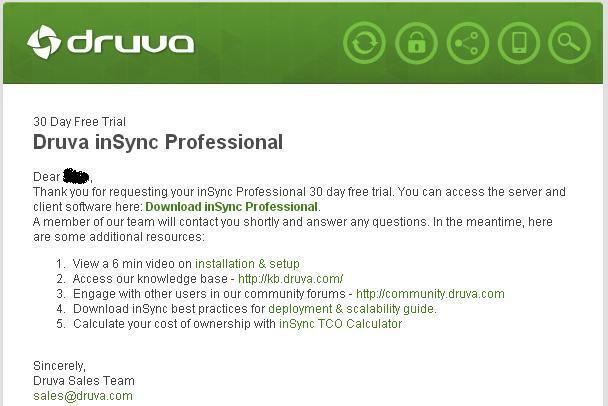 Druva customer support can be accessed through live chat, phone, email, and TT systems. With the exception of phone support, which is avaialable at all hours any day of the week for enterprise clients and limited to normal business hours for lesser accounts, support is pretty universal. 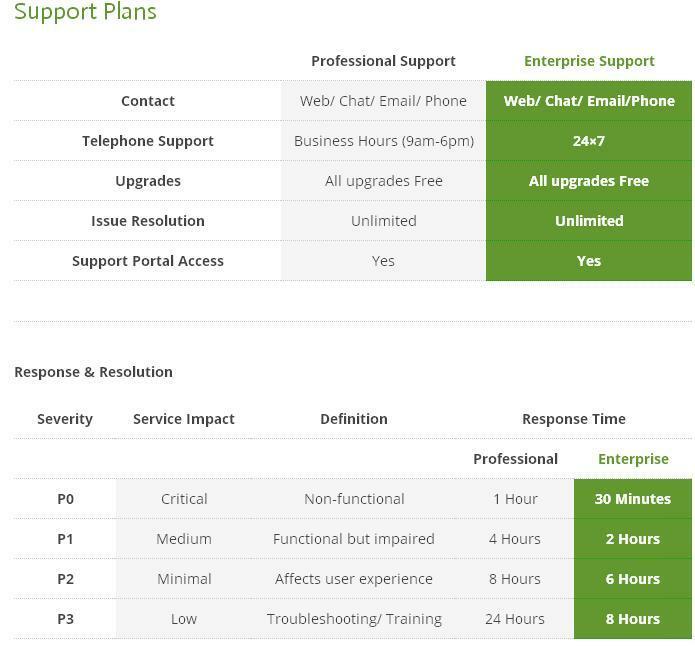 Druva’s response time for issues is predefined and tracked based on the chart below, and response time takes place according to service impact. For example, not functional will take precedence over a customer training issue, and here again enterprise accounts take precedence over others. 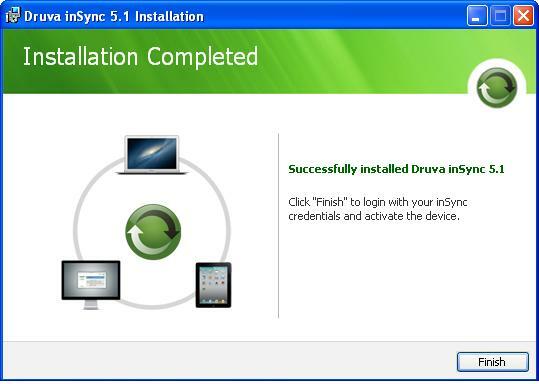 One of the most exciting features of Druva’s service is its simplicity and ease of operation and maintenance. 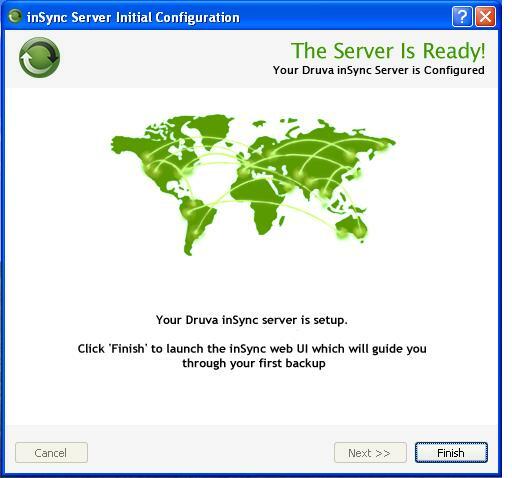 The inSync data backup and file sharing software operates through client and server communication with simple, integrated management tools, and getting started with Druva and its client software is virtually effortless. From start to finish shouldn’t take the average person more than 20 minutes. 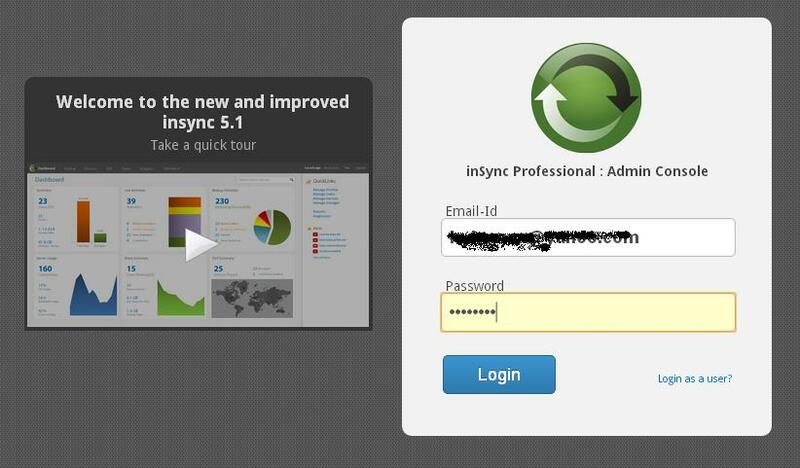 Next, configure your inSync Server software with the credentials, which will be used for backing up, sharing, accessing and transporting data within your teams. You will need web console details like TCP port, admin name, email ID and admin password, as shown in the following figure. Select Express Configuration for now and worry about advanced configuration as per requirements later on. Once you’ve configured your management, server, and data-base information, you will be taken to your Dashboard, as depicted in the following figure. 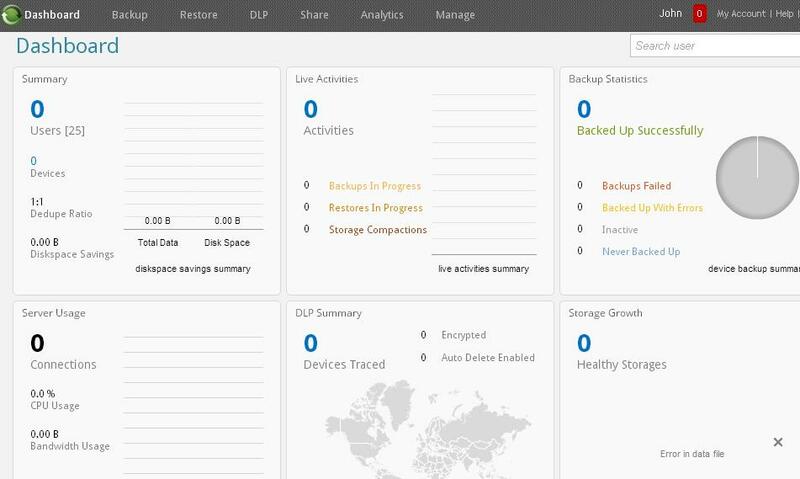 Here you can work and manage resources through different options such as Backup, Restore, DLP, Share, Analytics, and Manage. 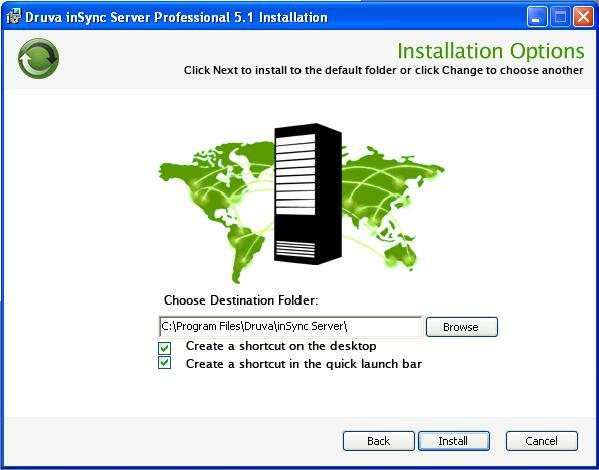 Manage Profiles can be used for server data management and synchronization with online storage, etc. To create a new profile click Create New Profile as shown in the above figure and fill in required information as shown below. Druva is especially suitable for medium and large size enterprises due to its tailored service of these companies. Price plans and customer service are fair for all, but suited most beneficially for large accounts. It also possesses amazing security of its networks, systems, and data transport. Druva delivers on its goals of helping businesses increase productivity and efficiency, and is therefore highly recommended. 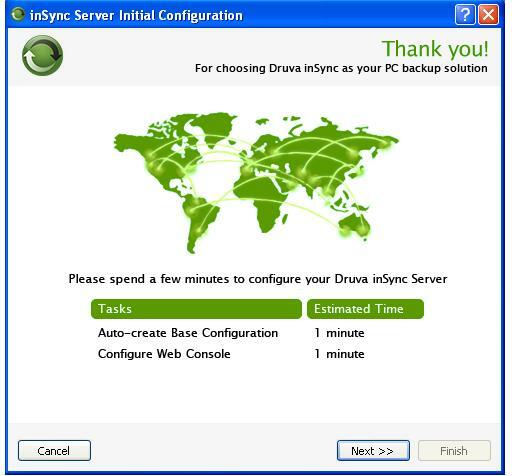 One major flaw with Druva’s backup software.. Although you can schedule backup frequency, you cannot specify WHEN it should happen. If you want your backup to occur, say, at 1am on a daily basis so as not to interrupt usage during regular hours then you need to stay up until 1am and manually kick off a backup. 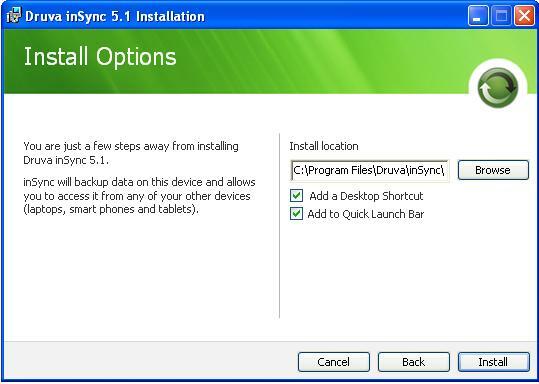 In my opinion, this is an obvious feature that any backup software should have. Awesome site, I can recommend them fully.